A cube root is asking the question, what times itself three times is this thing? You might check out Square Roots you haven't yet. There are several ways to write a cube root ∛x being the most common. But, and this is important, you can also write a cubed root of x as x1/3 power. So, the equation y3 = x could be written as y = x1/3. There are a lot of ways to solve just about any math problem. Finding a cubed root is no different. Now that most people's phones are calculators - this is probably not a problem. You could use your cubed root function ∛x (there's a key with this label on the side view of the i-phone calculator. You could find the logarithm and divide it by 3. No? Well, I'm not going to lie to you, without a calculator finding the cubed root of a number can be a pain. Hopefully, you know your squares up to at least 13 squared is 169. But cubes? 2 cubed is 8, 3 cubed is 27, and that 's about it for most of us. So, how would you find the cubed root of say 2028? Well, 23 is 8 and 20 cubed would be 8 with three zeros or 8,000. So, we know it's somewhere between 2 and 20 - whoopeee! 10 cubed is a 1 with three zeroes or 1000. Now we're somewhere between 10 and 20 and my guess is that we're closer to 10 than we are to 20. I'm putting myself to sleep, the answer is going to be 12.6577345.... so narrowing it down to that could take me some time. So - How can I calculate a cube root? If you are going to need to know cubed roots, and if you are calculating three dimensional objects, chances are you will need to calculate cubed roots, You may want to check out Desmos.com super cool calculator that let's you play around with the function and some variables to see what kind of graph you end up with. Cube Roots are a little different than square roots in a lot of ways. Remember a real number square root can never be negative. This isn't true of a cubed root. (-2)(-2)(-2) = -8 , so the cubed root of -8 is -2. 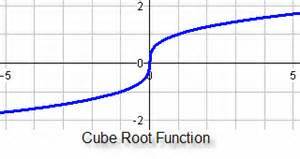 As you progress beyond Algebra 1 (this page is concerned with cubed roots as they pertain to Algebra 1). you are going to see a lot of cubic problems.